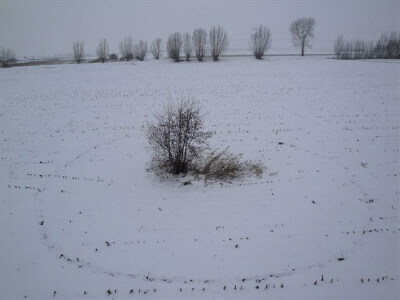 occurred near Hoeven: 21 simple rings, 1 tiny circle & 1 spiraled circle. At around 11:30pm (Netherlands time) on the evening of December 17, 2009 I called my friend Robbert van den Broeke in Hoeven, and we talked until about 1:30 - 2:00 am (Netherlands time) about various things. Near the end of our conversation Robbert said he felt that some circles might be coming and I got the feeling that this was likely to occur before Christmas. The next evening (Friday, Dec. 18th) at around midnight Robbert got a very strong feeling that a formation was arriving at the field not too far from his home which we call the "special" field (because so many anomalous events have occurred there over the years). He telephoned a local friend, Ellen Gomis, to ask if she would drive him to the field to see if a new circle was present, and Mrs. Gomis agreed. 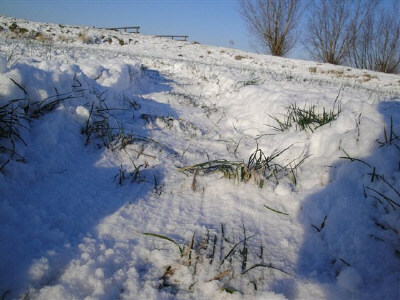 The temperature was about -10 degrees C and there was a 6-inch snow cover already on the ground. When they arrived at the field around 1:00 am (now Saturday, Dec. 19th) Robbert immediately felt what he described to me as a peaceful, very still, "holy" feeling and heard what he could only describe as sounding like a choir of "angels singing" in the air above the field. I asked if Ellen heard this, too, but Robbert said "no" -- it was only he who heard the "singing." 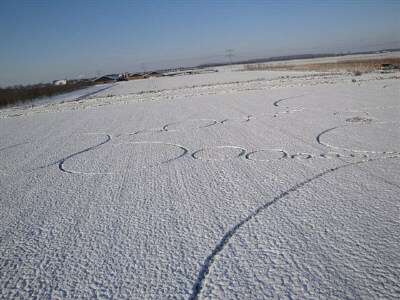 As they walked down from the dike they could both see multiple rings scooped out of the snow-covered field. and yet most are very circular. not piled up around the ring edges -- it is simply missing altogether. Because it was dark, and quite cold Robbert and Ellen did not stay long to inspect the field. 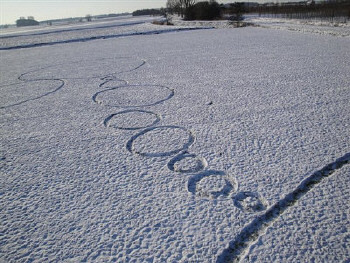 Later, when the sun had come up (Saturday, Dec. 19th), Robbert's friend Roy Boschman returned to the field to take photographs and was stunned to see the entire formation -- the largest such snow "circle" ever reported anywhere. Robbert has the feeling that the number of rings Roy saw in the morning (when these photographs were taken) is greater than those present the night before. He says this because of the "energy" he felt at the field when he and Ellen first arrived -- the intensity of which indicated to him that more rings were still "coming down" after he and Ellen left. 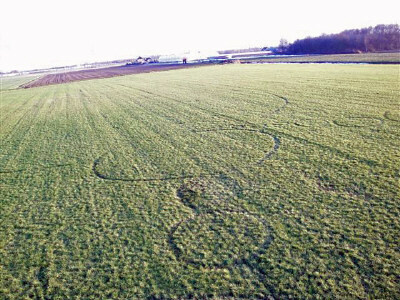 For those of us who know Robbert and who have been with him when the "normal" crop circles (those that occur in crops) are forming, we know that he experiences a very particular sensation while the event is in progress -- as the circles are actually occurring -- and this sensation is what I think he is alluding to here. into a ring, clearly causing a further indentation. 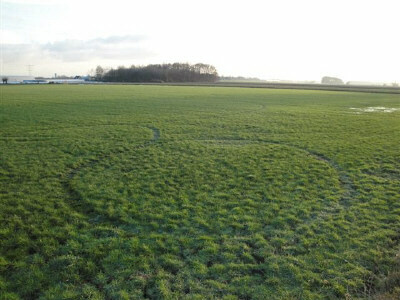 When Roy got to the field around 1:00pm on the 19th no footsteps were visible except near the edge of the formation close to the dike and in the first few rings, where Robbert and Ellen had walked the night before. 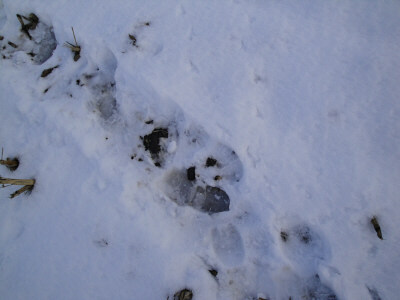 There were no footprints at all out in the rest of the field -- although clear tracks of hares were visible in a few places. And there were also no piles of the snow that had been removed from the rings anywhere. All of the rings were of the same width (approx. 11 inches wide), including the "spiraled" circle, and Roy saw no ice along the edges or bottoms of any of the rings. He did observe an undulating characteristic and very faint "brush-stroke" type lines in the large rings, but these were not present in the smaller rings. 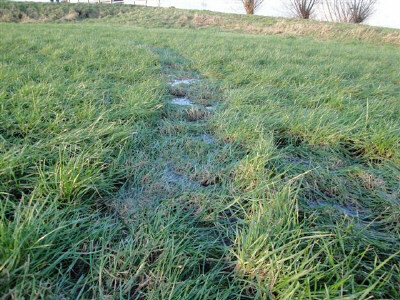 No human footprints were found anywhere out in the field. Center of spiraled circle is off-center, a common crop circle characteristic. 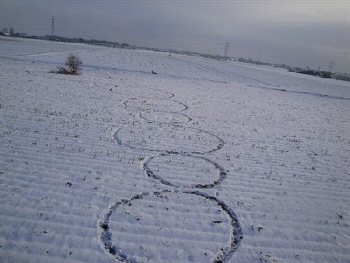 applied in rings to melt the snow. grasses, were seen only in the larger diameter rings. 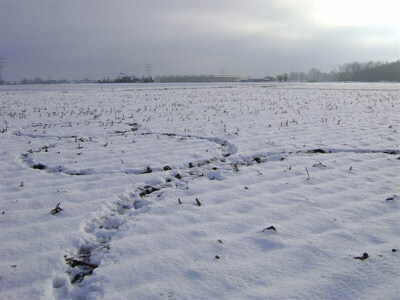 A final point needs to be clarified regarding the "geometric perfection" (or lack thereof) in crop circles generally, and in this Hoeven snow formation in particular. There is a widespread acceptance of the idea that "genuine" (meaning not mechanically flattened) crop circles are always geometrically "perfect." Based on the published scientific work carried out by the BLT Team during the 1990s bltresearch.com/published, this is total fallacy. scientific research clearly shows that "geometric perfection"
is not related to circle "authenticity." 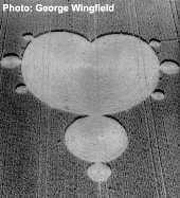 As has been consistently demonstrated by the BLT plant and soil research, precisely the same plant and soil abnormalities repeatedly documented in authentic "geometric" crop circles (bltresearch.com/plantab & bltresearch.com/magnetic) have also been found in what some Brits endearingly refer to as "wonky" circles (crop formations which are not as "perfect" in their overall design)...as well as in some totally randomly-downed crop areas found in many fields near "geometric" events: bltresearch.com/otherfacts. 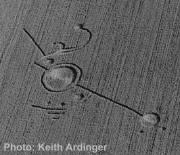 The scientific evidence is clear -- "real" crop circles are not always "perfect" in their geometric design, in spite of the fact that many circle enthusiasts and skeptics think this (bltresearch.com/published.mit). Some perfectly geometric formations (and even some of the really huge and complex geometric events) are the "real McCoy." But the notion that all genuine circles must satisfy this very aesthetic criterion is, I believe, an emotional, human imposition. There is no supporting scientific evidence for this assumption -- and considerable scientific evidence to the contrary. in 2008. Photo: N. Talbott. 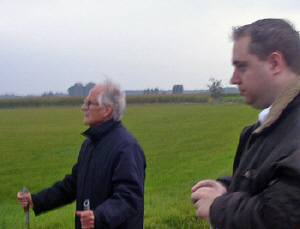 People who have been following the BLT reports about Robbert v/d Broeke will be familiar with many of the amazing photographs he obtains in crop circle fields, using not just his own camera but those belonging to other witnesses (bltresearch.com/robbert/photoanoms1, and bltresearch.com/robbert/ufophotos). And, as is the case when Robbert takes anomalous photos, he also experiences the presence of unusual "energies" just before new circle formations appear. Since observing Robbert in 2008, Dr. Roll thinks it is likely that all (or most) of the anomalous phenomena around Robbert emanate from Robbert's right-brain, which "has no language and instead expresses itself by dreams and other images -- which would include [the anomalous photos and also] the snow [circles]." Roll suggests that hypnosis sessions with an "expert hypnotist" might help uncover the "meaning" of at least some of these formations and/or anomalous photos. 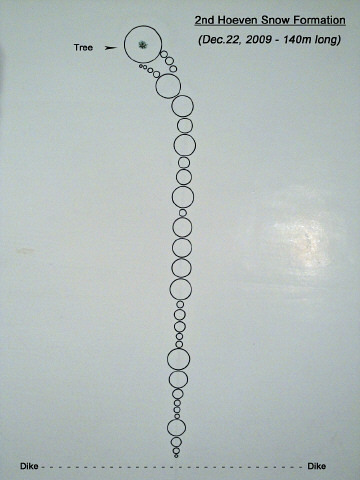 As indicated in his diagram (above) it is Roy's impression that the two largest rings were elliptical. Roy also noted the below freezing temperature (-10 degrees C) of the night during which the rings appeared, the lack of footprints, the lack of any marks in the centers of the rings, the lack of any evidence of icing where the snow had been removed, and the fact that the "missing" snow is not piled up anywhere in, or anywhere near, the formation -- observations which seem to rule out mechanical creation of the rings. 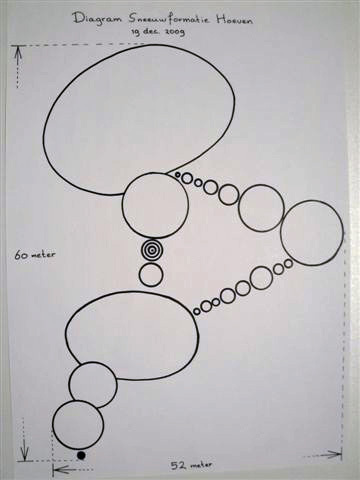 On December 20th Robbert and I were speaking on the phone again, and he told me he had the feeling that "more circles are coming." formation #1 relative to rest of field. longer & contains 35 rings. When Robbert called on the 22nd I was not surprised to learn that another, even larger (140m long, 35 rings) snow formation had appeared in the field next to Snow Formation #1. I have known Robbert for more than 10 years now and have never known him to be mistaken about these "intuitions" he has regarding new circles coming in his area. His experience of these "energies" that portend, and then accompany, the appearance of new circles is very intense, as anyone who knows him well can attest. It is probably significant that Robbert's mother also often experiences these same "energies," as does his younger sister Madelon -- sometimes for several days before the new circles actually appear. Robbert (and often his mother and sister) report a build-up in the intensity of these feelings in the days prior to new circles appearing, many times accompanied by considerable fatigue and angst, which then dissipates once the formation appears. What, precisely, this indicates about the mechanism actually involved I don't know -- but these feelings have been consistently experienced and reported by the family for more than 10 years, always culminating either in a new crop circle or some other phenomenal event. Much of the recent consciousness research suggests there may be an interactive biophysical aspect to these types of events, which might explain the physical symptoms experienced by Robbert and other members of his family. the fact that there was no sun. temp. is now above freezing & snow is beginning to melt. 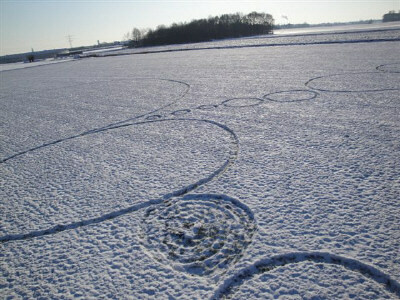 As was the case with the first snow formation, Robbert again experienced the particular "angst" or "disquiet" he has come to recognize as a precursor to the appearance of a formation. 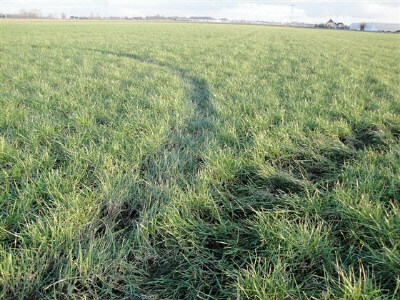 Late on the night of Monday, December 21st, he again called his mother's friend Ellen Gomis, to ask her to drive him to the fields and, when they arrived, the new rings were clearly visible. This time the formation was in Robbert's "special" field (special because it is the place where he first saw light-balls revolving around the tree at the back of the field, and then experienced a new crop circle). 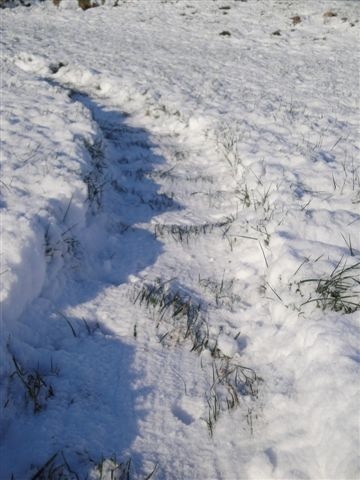 There had been more snow on Sunday (which had partially covered the first formation in the adjacent field) and the temperature was now above freezing, in the 3-5 degrees C range. Both Ellen and Robbert could see that these new rings extended into the field directly toward this tree. 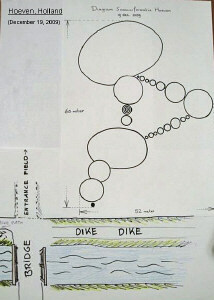 Experiencing a "very strong" energy as he stood on the dike, Robbert felt that this formation had appeared expressly for him -- that it was "intended" to help him further develop his abilities as a medium. Because Robbert is aware of the difficulty some people have in accepting the idea that the circles are not mechanically created he does not normally walk into new circles before his father, or Roy, have taken photographs...but in this case he felt impelled to walk slowly through the entire formation to further experience the energy that night -- which he then did. Therefore, in this formation, all of the photos we have were taken after Robbert had walked through the rings...leaving his footprints throughout. above freezing & Robbert has walked through the rings). 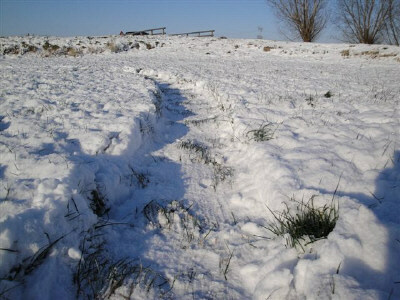 during the summer & cut stalks stick up through snow. where he had walked through the riings the night before. 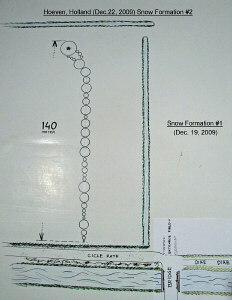 Roy's diagram of Snow Formation #2 in "special"
On the day after Christmas Roy Boschman returned to the fields and re-photographed the first snow formation. By this time several days of above-freezing temperatures had melted off most of the snow -- but interestingly the snow in the rings (where one might reasonably expect it to be melted away entirely if it had been mostly removed or compressed originally by a human creator) was largely intact. The formation had, by the 26th, been visited by a number of people and some of the rings had now been walked through, so no solid assessment can be made regarding footprints. 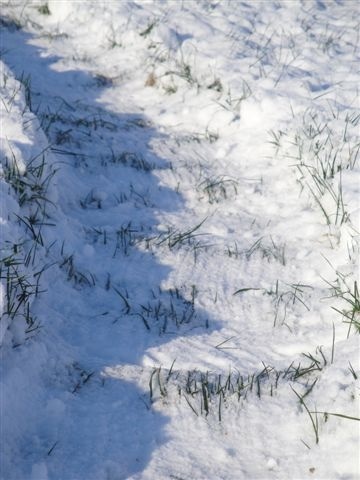 above-freezing temperatures have melted off most of the snow. can barely be made out in adjacent brown field. 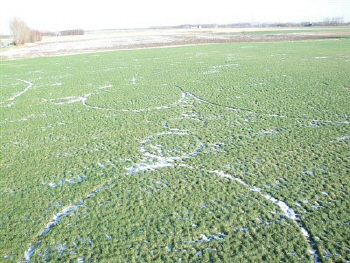 By December 28th, 9 days after the first snow formation appeared, warmer temperatures had melted most of the snow on all of the fields. 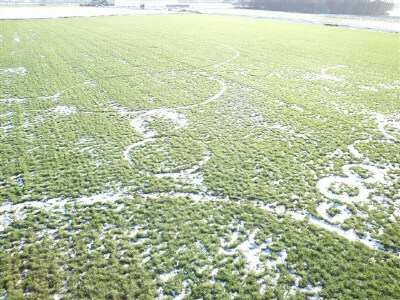 The photos taken on the 28th reveal that the rings were not present only in the snow, they are also swirled into the grass underneath. 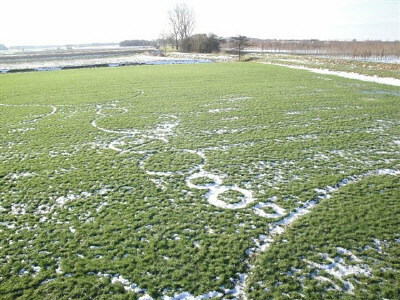 Since the early photos show that the snow in the rings was not removed or compacted all the way to the ground the discovery that the rings are also clearly visible in the grass is remarkable. Whatever caused the snow rings also swirled the grass beneath the snow so that the formations now look very much like typical crop circles. Snow is almost entirely melted by Dec. 28th (9 days after formation occurred). No flattened centers were visible in any of the rings. 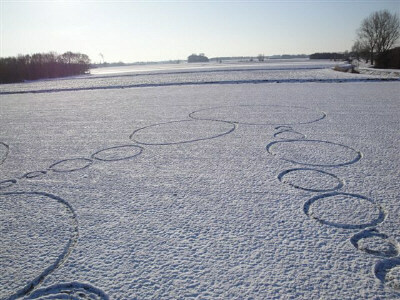 beneath the snow-rings is swirled in typical crop circle fashion. In these Dec. 28th close-up photos of the first formation it is clear that the width of the rings is much greater than that of a human foot. 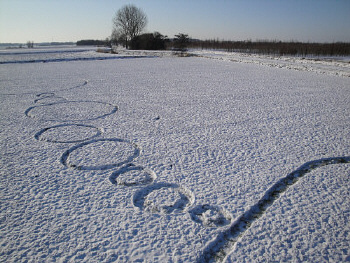 When you consider the very large overall size of this formation (60m x 52m), the fact that it occurred in -10 degrees C weather, and the number and varying diameters of the rings as well as their mostly circular nature -- in which we still see no flattened centers -- the "pranks with planks" theory seems an inadequate explanation to me. Addendum...We know that aerial photographs would provide additional detail but we do not have the necessary funds at the moment. Also, since these are the first snow formations we've had to document -- and since they occurred so very close together -- we were not as well prepared as would have been optimal. We have now developed a protocol (utilizing video documentation also) which, if more snow formations do occur, we will do our best to carry out. © 2009 BLT Research Team Inc.